Selsey Cricket Club is home to the Sir Patrick Moore 3D exhibition. 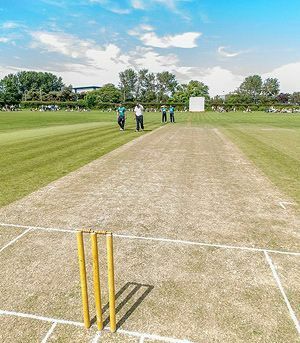 Cricket had been played in Selsey before the clubs foundation and a famous incident occurred in 1647, when a fielder called Henry Brand died, after being struck on the head by a batsman trying to hit the ball a second time to avoid being out. One of the clubs most famous members was the late B.B.C. astronomer Sir Patrick Moore, C.B.E. Sir Patrick was a former Club Secretary, and an active playing member, and was an Honorary Life Vice President. A former President of Selsey Cricket Club was Hubert Doggart, O.B.E., MA. He was the son of the sportsman Graham Doggart who rose to chair the Football Association. Doggart represented England in two Test matches in 1950. He was President of the MCC (1981–1982), the Cricket Council (1981–1982) and the Cricket Society (1983–1998), and he chaired the Friends of Arundel Castle Cricket Club (1993–2003). In the 1970s he played occasionally for Selsey CC. Looking for events in Chichester?